When it comes to innovative, leading-edge cardiac care, the Joel E. Smilow Heart Institute at Bridgeport Hospital has a reputation that can only be described as first rate. 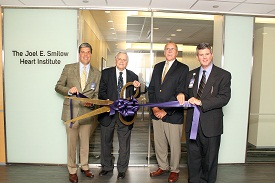 L to R: Foundation president Steve Jakab, Joel E. Smilow, Chief of Cardiology Stuart Zarich, MD, and hospital president Bill Jennings. Our dedicated nurses, cardiologists and cardiac surgeons have delivered personalized care to thousands of patients and have created an impressive history of heart firsts. We performed the first bypass surgery, coronary stenting, defibrillator implant and atrial fibrillation ablation in the entire region, as well as establishing the first chest pain center in the region. This has resulted in Bridgeport Hospital being recognized nationally as a center for leading-edge cardiac care. In fact, the reputation of our physicians and cardiac program is so outstanding that doctors from all over the world come to Bridgeport Hospital for cardiac training. We specialize in the entire continuum of cardiovascular care from primary prevention, treatment and interventions to cardiac rehabilitation. We also offer access to state of the art research studies.